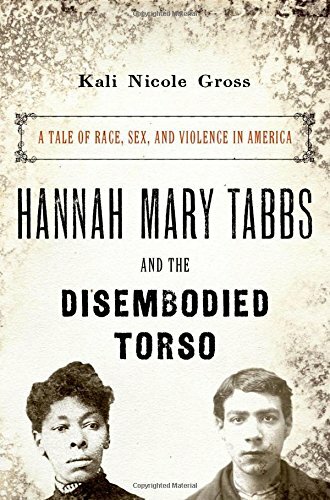 Hannah Mary Tabbs and the Disembodied Torso is a historical whodunit based on events that took place in Philadelphia in 1887. The story begins with the discovery in a river of a headless, limbless, male torso of ambiguous ethnicity. The historian Kali Nicole Gross considers that the possibility of the torso’s belonging to a white male made the authorities at the time take the crime more seriously. Gross plunges into the minutiae of the chase using detectives’ notes, court and prison records, local newspapers, and other archives. The torso proves eventually to belong to Silas Wakefield Gaines, described elsewhere as “a dark mulatto” apparently killed by his female lover, Tabbs, and his friend George H. Wilson, although exact attribution of who did what and why will always remain a mystery given the web of counter-accusations and evasions that ensued—and in the absence of fingerprinting, DNA analysis, and surveillance cameras at the time. While Gross thinks on balance that Tabbs was the killer, she received a sentence of only two years while Wilson was sentenced to 12 years in solitary confinement, eventually commuted to nine years and three months. The historian is fascinated by Hannah Mary Tabbs as representing a type rarely glimpsed in black women’s history: that of a violent, devious, sexually aggressive “anti-heroine” who managed to manipulate the criminal justice system through her meek and decorous demeanour in court, which both the black and the white communities found convincing. On the other hand her “colored” accomplice Wilson was the subject of “fear, anxiety, and suspicion” because of his relative “whiteness” and took the fall for a crime he had no reason to commit. Gross shows tremendous mastery of details—even down to the decoration of detective Chief Kelly’s office. But the rapid introduction of indistinguishable, apparently minor characters threatens to overwhelm the narrative, especially in the initial stages. But then, as the author states in the beginning, she would like the reader to experience this story as she did with all its uncertainties and gaps. In this she has succeeded. The reader not familiar with this period of American history would also benefit from more background and contextual data without which Gross’ analysis of the dynamics of gender, race, and class being played out in this case—while extremely interesting and ultimately convincing—seems imposed upon rather than emerging from the material presented. This is excellent stuff and more of it, and much earlier, would have helped to compensate for the paucity of data on the two main protagonists, and provided a better explanation for the reactions of others to them. Perhaps historian Gross should next consider a bio-fiction treatment of these fascinating characters and events given the understandable gaps in her data. Nevertheless, Hannah Mary Tabbs and the Disembodied Torso is an engrossing whodunit and a gripping read with a suitably ambiguous ending that is not easy to forget.